Austin, Texas is always a good place to start a band. My Education is around for almost 15 years producing instrumental post rock topped off with psychedelic and cinematic touches. Although also present on the new album ‘A Drink to my Friends’ the classical instruments Cello and Viola doesn’t give the record a sad feeling as most of those type of postrock bands do. As the title implies the songs are upbeat, sometimes spacey and positive. They are friends with the amazing band Maserati and they remember their long-time friend and the inspiring Maserati drummer Jerry Fuchs (who died in an elevator accident) with the track ‘Roboter-Höhlenbewohner’. Needless to say this song is very inspired by Maserati; directly one of the best songs of the record. Before the band builds up the atmosphere with cello, viola, drums and subtle guitar in the songs ‘A Drink…’ and ‘…For All My Friends’. Of course this trick is done very often but My Education can compete with the best work of Gregor Samsa and Explosions in the Sky. At the right moment a pedal steel guitar is battling with the cello and viola combined with an up-tempo beat. ‘Black Box’ continues in the perfect instrumental postrock vibe and I can’t wait to see them on the Dunk! Festival next weekend. Yes, they are in Europe right now. Then it’s time for the Jerry Fuchs tribute and I wish they will play this track also. The song is the perfect salute and brings up memories from good times. After this danceable song My Education gives it a rest with Happy Village that could’ve been a part of the last Mogwai albums except for the pedal steel guitar. It’s slowly going faster and with more volume towards a mangling psychedelic ending; how about surprises. They top the record off in style with the punky instrumental ‘Hormunculus’ that has a saxophone included at the end. The energy and happiness is charming and concludes this record with a smile! 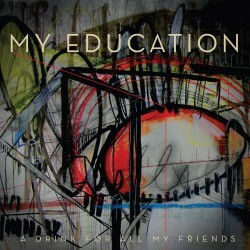 My Education has proven Post Rock is still not boring in 2013.